← The not yet professional retoucher. Knowing what you have and what you need. For Wacom, I recently attended a Photography show hosted by the AIPP in Brisbane. I had a stand displaying our Cintiq and Intuos4 products. I was quickly reminded, for people who have never used a tablet before it can be quite a challenge to learn how to use one. Simple things I’ve taken for granted, like knowing how to hold the pen or even the fact that your tablet enables you to use pressure sensitivity in your favourite graphics application are often assumed knowledge. Unfortunately, not everyone who comes to see me knows this! I’m going to outline how to do a few things for the people who are completely new to the idea of using a tablet. So, what can you look forward to learning? How to hold the pen. Watch that rocker switch. Flip your pen. Surprise! It’s an eraser. Learning how to find the cursor (tablet mapping), this isn’t a mouse! You don’t push the cursor around the screen with a tablet. Enabling pressure sensitivity in Photoshop. The above points are the bare essentials that everyone should know who has either just purchased or are thinking about purchasing a tablet. How to hold your pen. I’ve seen many ways that people hold the pen. Almost always the first time someone picks up one of these pens it is incorrect. Lets have a look at how NOT to hold the pen. Why is this wrong? Well, some people are afraid to touch the surface of the tablet. 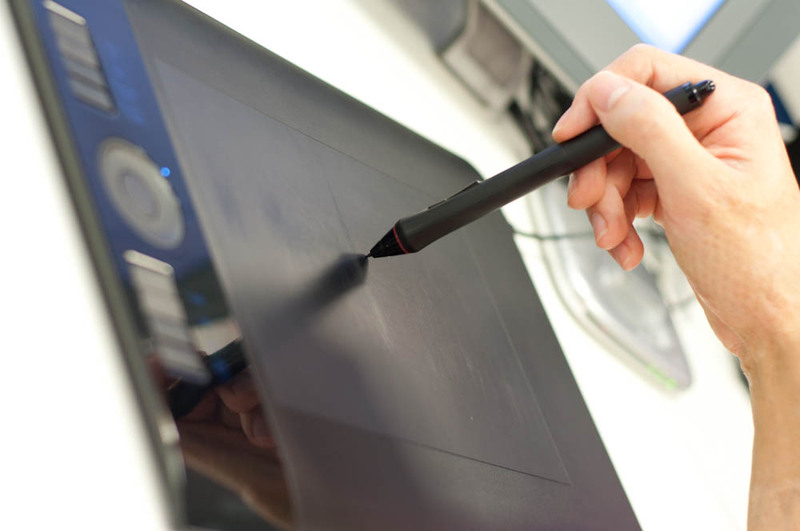 With the Intuos4 the only thing that will move the cursor around your screen is the pen. You can touch the surface all you want, it won’t break and it certainly will not interfere with the movement of the cursor on the screen. Apart from that, you get no accuracy when it comes to drawing and pressure control. A little better, but still incorrect. A lot of traditional artists tend to default to holding the pen this way. As the nibs (the tip of the pen) controls all the pressure sensitivity if you hold the pen this way it is impossible to take advantage of this feature. This is how you should hold your pen. Holding the pen this way gives you the most accuracy and control. Make sure you rest your palm on the surface of the tablet and keep the thumb with in easy reach of the rocker switch. Try to keep the rocker switch in a position that you won’t accidentally activate the button. If you’re just starting out with the tablet and you continuously activate the rocker switch jump in to your tablet settings and disable it. That way you can concentrate on getting used to the tablet. 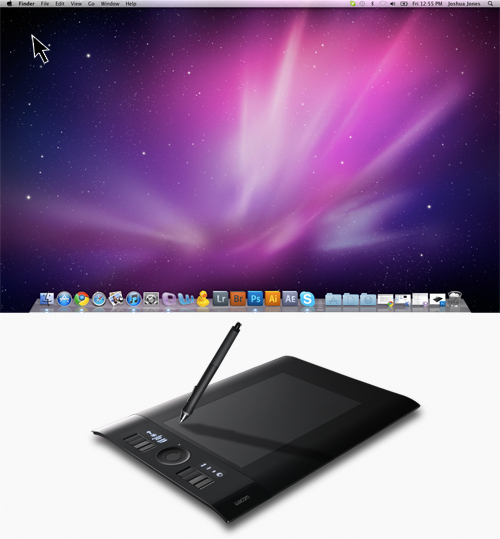 To do this go to System Preferences -> Wacom Tablet. Then disable the rocker switch functions. Make a point of trying to get used to holding the pen the right way. It will make getting used to your tablet much easier. I should also point out that you simply need to hover the pen over the surface of the tablet. When you wish to ‘left-click’ you touch the pen to the surface of the tablet. What’s this knob thing on the back of my pen? One thing that always gets a reaction is the fact that the back of the pen is an eraser. Inside Photoshop you can simply turn the pen around and draw with the back of the pen. You’ll notice this will erase parts of the current layer. You don’t even have to select the eraser tool! It’s a very convenient feature when it comes to tidying up brush strokes. To change the size of the eraser just hit the [ ] keys or use your toggle wheel set to brush size while you have the eraser hovering over the surface of the tablet. You’ll notice that this size is independent of the brush size of the pen. This tablet is stupid! Where is the cursor going? Let’s face it. You’ve probably been using your mouse since you first started using a computer. If you’re my age that’s probably around 15 years ago, assuming I used a computer for the first time when I was 10. This is where the problem lies, using a tablet it very different to using a mouse. People are very used to ‘pushing’ a cursor around the screen. A tablet is mapped to your screen. To put it simply, the ‘active’ area of your tablet represents your screen. What the hell does that mean? Think about it this way, if I place my pen in the very top left of the active area of my tablet the cursor will jump to the same location on your screen. For those of you using a mac, it will be somewhere near the Apple button. Likewise, if I move the pen to the very bottom left side of the active area your cursor will jump to that same location on your screen, for those of you at home using Windows, it will be somewhere around your Start(Windows) button. That is probably the hardest thing to get your head around when it comes to using a tablet. Almost every first time user will place the pen somewhere in the middle of the active area and try to ‘scroll’ or ‘push’ the cursor to the corners of the screen. It isn’t until I show them that the tablet is mapped to the screen and that if you want something on the desktop you need to move the pen to the corresponding location on your tablet that the frustration subsides. Even still is takes practise to get used to this and naturally they’ll default to trying to ‘push’ the cursor with the tablet every now and then. Here you’ll notice the Pen is over the top left area of the tablet which shows the cursor in the top left of the desktop. Here you’ll notice the Pen is over the bottom right area of the tablet which shows the cursor in the bottom right of the desktop. 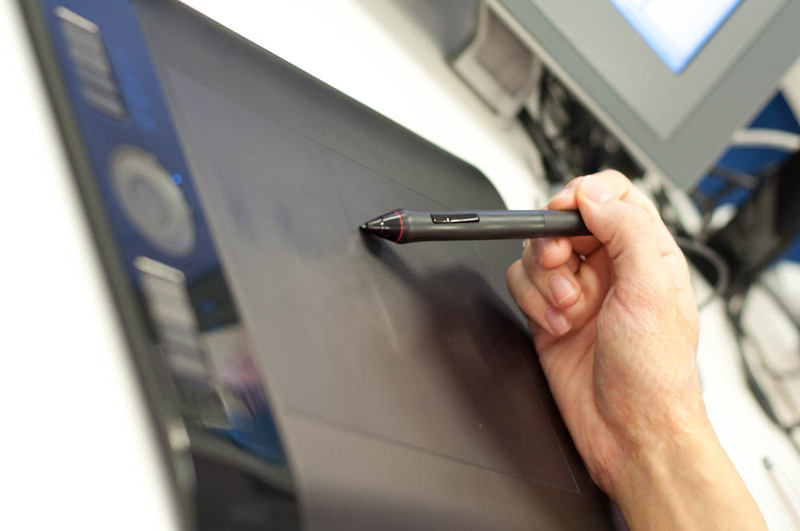 Enabling Pressure Sensitivity in Photoshop CS5. 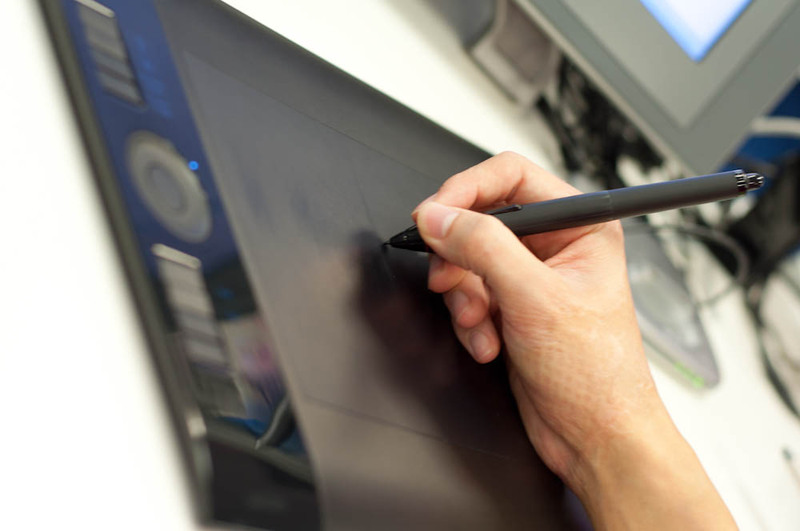 One of the major advantages of using a Wacom Tablet is that you can use pressure sensitivity in your preferred graphics application. We’re going to have a look at making sure your brush settings inside Adobe Photoshop CS5 are setup correctly to allow you to use pressure sensitivity to control settings such as brush size and opacity. Well, to put it simply. If you press harder on the surface of your tablet with your pen your brush stroke will look different depending on which settings you have enabled. If you have told Photoshop to recognise pen pressure for brush size you will notice an increase in the radius of your brush stroke if you use more pressure on the tablet. Lets do it. Open up Photoshop. We need to choose the brush tool. Press the keyboard shortcut ‘b’. To open your brush panel, either press ‘F5’ or go to Window -> Brush. Make sure your brush is setup with Shape Dynamics ticked and the Size Jitter control is set to off. Also, tick Transfer and make sure that the Opacity Jitter control is set to off. Why are we disabling the Size Jitter and Opacity Jitter when I can see that there is an option for me to use Pen Pressure? 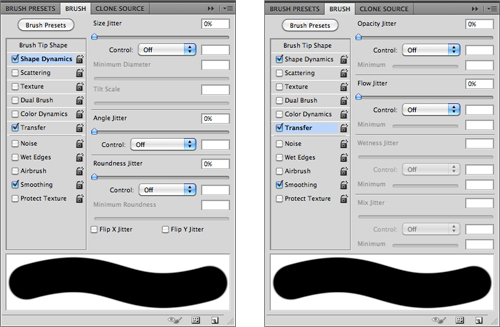 In Photoshop CS5 when using the Brush tool, the clever guys at Adobe added two handy little buttons. They actually override any options you set inside the brush panel. For this reason it’s easier for you just to set the Size Jitter and Opacity Jitter controls to off. You’ll see them at the top of the application and they look a little something like this. Tick this icon to activate Size Jitter to be controlled by Pen Pressure. Tick this icon to activate Opacity Jitter to be controlled by Pen Pressure. The two can be used together to create unique brush strokes. If you have an Intuos4, you can tell Photoshop to control things with Pen Tilt. If you have a suitable brush, try telling Photoshop to control Angle Jitter with Pen Tilt. You’ll notice your brush strokes will replicate the angle of the Pen to the Tablet. Unfortunately Bamboo users cannot take advantage of this tilt sensitivity. 1. Size Jitter and Opacity Jitter buttons disabled. 2. Size Jitter button enabled, Opacity Jitter button disabled. 3. Size Jitter button disabled, Opacity Jitter button enabled. 4. Size Jitter and Opacity Jitter buttons enabled. That’s it! Feel free to play with these settings to create a brush stroke suitable to your needs. 5 Responses to Wacom Tablets. The basics. Excellent article above, it helped me. All I want to do is TRACE photos into my computer. If the photo is bigger than the working space on the tablet? I have the medium intuos 4 I can’t afford a huge tablet, surely there’s some way around this? If you’re going to place a photo on top of your tablet and try and trace it then yes, you will need a larger tablet if the photo is too large. I would try scanning the photo, opening it up in Photoshop creating a layer above it and then tracing it on that layer. You can then hide the bottom layer (photo layer) and then you have an outline of your photo. No need for a bigger tablet! If you don’t have much experience with Photoshop this might be a little difficult for you. There is a heap of stuff on the Internet that can get you started with Photoshop. Google is your friend! I want to use the radial menu to specify brush size in Photoshop, any idea how to do that? Using the keyboard shortcut of [ or] will increase or decrease, and right now I have two button set up with the brackets, but I’lm always clicking them several times to get to where I want to be. I would love to have the radial setup so that each wedge is set to a specific size – 2, 5, 10, 20, etc. so I can choose the right size fast. I can’t find a keyboard shortcut to give me specific brush sizes, only the bump up or down shortcut. I have CS6. I’m not aware of a way to set it up like this, I don’t think its possible. I’ll look into it though. I was wondering if you know how to setup the pen eraser to function the same as the pointer? My pen tip is broken but the back part still functions and I still currently don’t have the budget to get a replacement.